Many fluids, chemicals, fuels, lubricants, semi-solids, and powders are seriously affected by moisture and other contaminants. Many of these materials which are affected are often stored in tanks or reservoirs which are either located in the open and vented to atmosphere or are located in the process area. Fluid contaminants, such as moisture and dirt, will be ingress into the tank whenever material is drawn out of the tank by operational demand, thermal breathing, or barometric pressure changes. Moisture in the form of water vapor is the prime source of contamination. It will cause simple dilution of acids, an increase in the corrosivity of oils and other fluids, fungal or biological growths, or the lowering of electrical resistance of transformer oils and similar materials. Many applications use vent pipes, filter caps, or turn down pipes to protect contaminants from entering their tank or reservoirs. These solutions will filter particulates but do not filter the #1 contaminant of fluids, water. To protect your storage tank or reservoir from water AND contaminants a tank vent dryer should be used. Tank vent dryers serve as your first line of defense against moisture contamination. 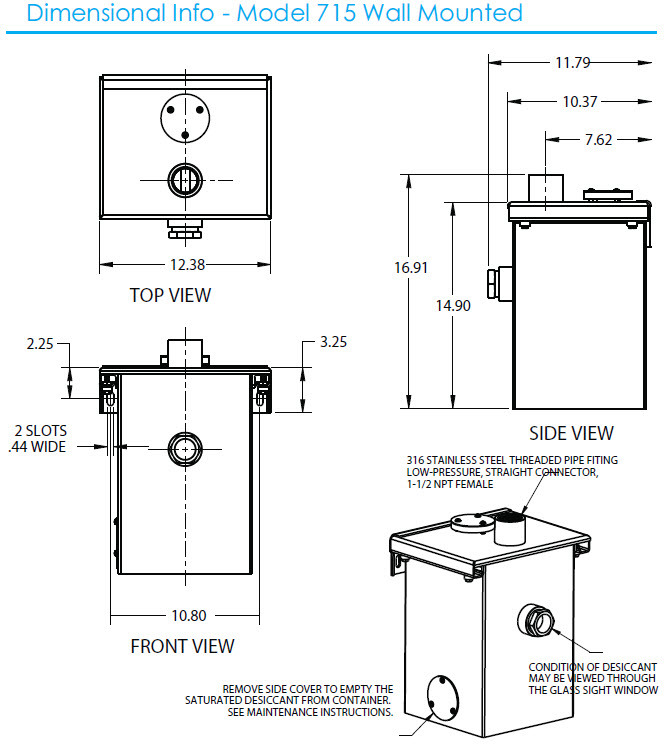 Tank vent dryers can be remotely floor mounted or wall mounted and are connected to the air vent on a tank or reservoir. Once connected to a tank, incoming air is drawn through the tank vent dryer where it flows through our high efficiency ZEOLITE desiccant and moisture is adsorbed down to less than 100 PPM moisture. Once the tank becomes fully saturated, the visual sight window on our TVDs will give a visual color indication that it should be replaced. Once the desiccant is replaced the unit is ready to back into operation. All tank vent dryers use a series of flapper valves to control the inflow and outflow of air. This maximizes the desiccant performance and prevents desiccant contamination during exhale from tanks or reservoirs. All Tank Vent Dryers are made of 316 stainless steel to withstand the elements and environment for decades. Viton O-Rings are also used for very harsh applications. Tank vent dryers are easy to install and can either be wall or floor mounted. Floor mounted models feature a desiccant tray or lever which allows for easy desiccant replacements in the field. 500 PPM (Parts Per Million) = 0.05% = 50cc of water in 1,000 liters of fluid. Fluid contaminants will ingress into a tank or reservoir when material is drawn from the tank by operational demand (filling/cycling), thermal breathing, and barometric pressure changes. With a tank vent dryer in place, wet atmospheric air will enter the base of the vent dryer and flow upward through a bed of ZEOLITE desiccant removing water down to less than 100 PPM. This VERY dry air will then flow into the storage tank or reservoir. By keeping the free air volume in the tank or reservoir constantly dry will actually liberate moisture from within the tank contents itself. This dynamic is vital for maximum performance and life of the materials being stored. 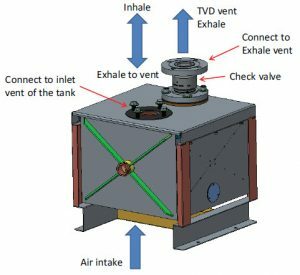 During exhale, or when the tank is being filled, it will push air from out of the storage tank and back into the vent dryer. The air will travel back through the tank vent dryer and hit a flapper valve, causing the air to vent to atmosphere, preventing any of the desiccant being contaminated from exhaled vapors. The valves work both ways essentially controlling the inflow and outflow of air to maximize performance. Drytech Tank Vent Dryers use a 1″-3″ NPT connection into most tanks or reservoirs. 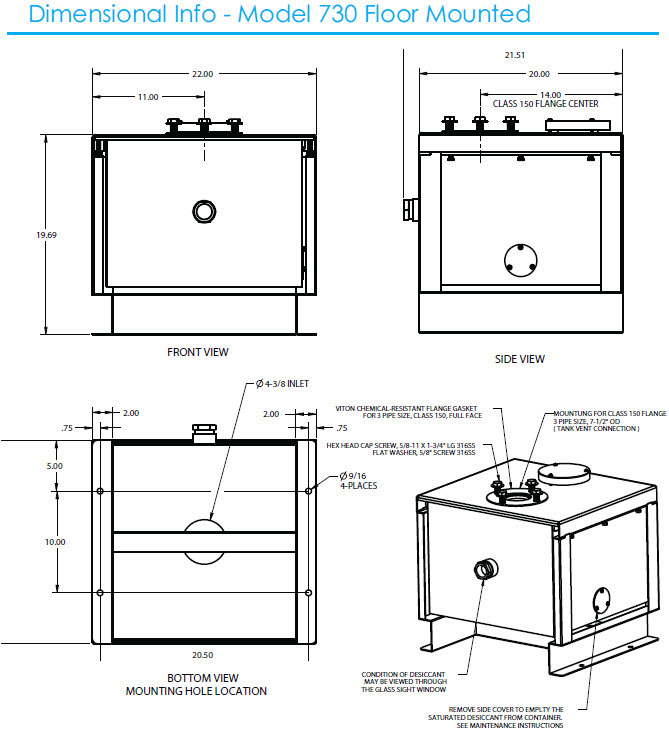 If you have any questions on how to mount your tank vent dryer please contact our technical staff. We maintain a large vent dryer inventory – typically 4-6 week or less delivery *expedites available upon request.